Thermal based barcode printers provide a very economical way to create high-quality labels, tags, wristbands, receipts, and tickets. Compared to other printing technologies, thermal-based options require less maintenance, have less expensive media, and print faster while maintaining excellent print quality. • Where will the printer be used? Is it a rugged environment? • What kind of media will you make? Labels, tags, wristbands, receipts, or tickets? • How often will you print? • Will the printer be in a fixed or mobile application? The first question when finding the right printer is deciding what type of printing you’ll be doing. Printers can be divided into 4 category types depending on how mobile they are and if they can make labels, receipts, tickets, or wristbands. This type of printer is made for small volume applications that are making fewer than 500 labels per week on average. Desktop printers are perfect for asset labeling in an office or light printing duties at a retail store. Printers like the AirTrack DP-1 still produce the same quality and wide range of media as bigger printers, just at a smaller volume. Industrial printers are larger and more rugged than desktop models for high volume print applications. From a couple thousand labels per day to printing all day long, these printers are designed to hold more media and there are models that support printing from .5″ to over 8″ wide. You’ll find printers like the AirTrack IP-1 in manufacturing and distribution centers as well as large retailers. If you are printing any type of media in large volumes, industrial label printers are your most reliable option. Mobile printers are similar to thermal label printers but provide freedom from any cable connections to a PC. Mobile printers do have a few limitations due to their small size. They are not made for very high volumes, have limited roll capacity, and have smaller print widths, usually 2″, 3″, or 4″ max. However, if you need to make labels or receipts on the move, a mobile printer will provide you high-quality print in a compact package that fits on your hip. These printers are perfect for delivery drivers or sales agents to create receipts in the field or a warehouse worker that needs to make labels on the spot. Since these printers are not tied to a fixed PC, you normally communicate to them wirelessly through Bluetooth or Wi-Fi. Pair a mobile printer like the Zebra QLn320 with a laptop, mobile computer, or smartphone for printing wherever you go! Even though standard label printers can also create wristbands, a dedicated wristband printer offers several advantages and a lower overall cost. For applications that are making wristbands every day like hospitals, theme parks, and concert venues, a dedicated wristband printer is a perfect fit. While other printers have their media on a roll, wristband printers have cartridges that simply drop into place to keep you printing with almost no downtime. These printers also have a higher print resolution standard for clear, accurate printing of images or logos. Added to this, most models have a special anti-microbial case to meet the demands of any healthcare environment. If you need custom printed wristbands on a regular basis, a dedicated wristband printer like the Zebra HC100 will be the most efficient and easiest to use solution. Ticket printers are another specialized thermal printer that excels at printing on thicker paper for ticketing applications. If you are making tickets for concerts, festivals, or any other type of event, a dedicated printer will help you make them faster with less hassle. Since most tickets come in a fan-folded stack instead of rolls, these printers have a taller case to accommodate more stacked media. They can also still use roll media but with a larger stack of tickets, you will spend less time reloading the printer. These printers also have an opening on the back of the case to easily feed ticket stock externally. Models like Datamax-O’Neil M-4210 are a high-performance option for demanding ticketing applications. 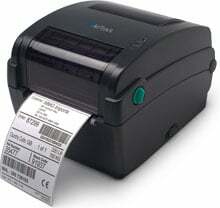 Once you know what type of thermal printer you need, the next big concern is what print method you’ll use. Thermal printers are capable of printing in 2 different ways – direct thermal (DT) and thermal transfer (TT). Depending on how long you need the label to last and the material it’s made of, one of the two methods will be more effective for your application. Direct thermal printers utilize heat-sensitive media that blackens as it passes under the printhead. Because they print without a ribbon, direct thermal printers are noted for their simplicity. Direct thermal printed labels typically have a considerable shelf life but are not well suited for environments that expose them to heat, long periods of direct sunlight or abrasion. Because of this, thermal labels, tags or ticket stock are often top coated to resist these elements. 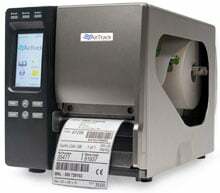 Direct thermal printing produces sharp print quality with good scan ability using only one consumable. For any short-term labeling application, like shipping labels, direct thermal is the most efficient print method. Every printer has to be able to communicate with a computer of some type to receive print jobs for everything that’s printed. While it is possible to set-up some printers in a standalone mode, you still need to connect to a PC to set-up the printer in the first place. The majority of printing applications, however, will require constant connectivity so the printer can know exactly what to print. All of the fixed desktop and industrial printers will offer multiple options for connectivity, with USB being the most common today. Any PC or laptop today will have USB connections and it is by far the easiest to set-up. Simply plug in the printer, install the driver on the PC, and you will up and ready to print. Options for serial (RS-232) and parallel connections are still available for most printers as well. 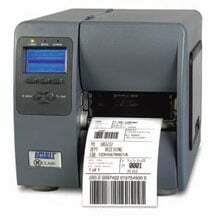 With network connectivity being a standard today, options for Ethernet and Wi-Fi have become much more common in label printers as well. When your printer has an Ethernet connection you simply connect to a network port and now it can be configured to be accessed by anyone on the network as opposed to a single PC like the case with USB. Some of the high volume industrial printers, like the AirTrack IP-1, now come standard with Ethernet connectivity due to the ease of access it provides. When you don’t even want to deal with cables, Wi-Fi on a printer makes it easy to put it anywhere you like. Mobile printers are the one special case since, by design, wireless connectivity is a must. Most models do offer a USB cable connection, but to get the advantage of mobility, Wi-Fi or Bluetooth will be used. Wi-Fi requires a wireless network to communicate just like a fixed printer. As long as you are within the network the printer will work but for fully mobile applications, Bluetooth is a better option. Bluetooth reduces your wireless range to 33ft but works without a network since the 2 devices talk to each other directly. Given you are probably communicating to a mobile computer or tablet in your hands and the printer is on your hip, this is not an issue. After you’ve narrowed down the type of printer and how you will print with it, the last step in finding the right printer is determining what add-on accessories you might need. Many print applications may not even need any of these options, but they can also be what makes a specific printer an indispensable tool for your business. Most of these options are only available on desktop or industrial printers, though specific add-ons will vary by model. A cutter does exactly what it is named. As the label is printed the cutter will separate the single label from the roll it is attached to. Most label stock is perforated already so it is easy to tear it off the printer but when you are using continuous or special media a cutter is essential. A rewinder is an internal roller that allows you to print labels and have them feed back into the printer onto a new roll. This option is especially useful for high volume applications that are printing large batches at one time. With a rewinder you end up with a roll of printed labels as opposed to a pile of labels in front of your printer. This option takes each label as it is printed and separates it from the backing liner. Peelers are perfect for applications that are printing individual labels and then applying them to a product immediately. It saves time from having to tear off the label and then peel it. However, if you print in batches this is not a good option since the printer stops printing until you remove it from the printer after it has been peeled. Some printers, including a few mobile units, offer options for making RFID based labels. With this option, you can print on the front of a label while encoding information into the RFID chip on the back of the label. RFID options vary depending on what frequency range you will be working at and most printers will support UHF or HF ranges. Making RFID tags can be a challenge for those not very familiar with it. Speak with one of our RFID experts to ensure you get the right printer for your RFID needs. An in-line verifier is essentially a special type of scanner that mounts to the front of the printer. This scanner is analyzing each label that is made to ensure it meets specific print quality requirements. If a printer like the Printronix ODV-2Dstarts to make labels below the grade you specified, the verifier will stop the printing process. When you are sending labeled products to large retailers or government/military locations, they will have strict rules on the print quality of the labels you make. The fines involved in not meeting their compliance are guaranteed to be more than the cost of the verifier. Any business that has to meet any kind of print compliance should seriously consider an in-line verifier for their printer to easily avoid the fines and headaches of poorly printed labels. With all the options available for barcode printers today, it can be a challenge to find the right device for your business. Determining the type of printing, overall volume, and what features you need from above will make deciding on a printer easy. If you are still having difficulty or have additional questions, feel free to call our experts – we’re happy to help you find the right printer for your needs.